I have had so much fun playing with supplementary wefts this week on my white warp! This is the start of my blank canvas…an off-white plain warp-faced piece of fabric into which I can weave patterns with tencel supplementary weft. My inspiration came from several textiles from Bhutan that I saw during my recent trip to the US and I was able to use patterning skills that I learned in Guatemala to set up the warp and lay in the wefts. It has been fun to be able to apply the skills learned on one continent to weave designs from another. First came the insertion of the two patterning sticks. From what I have seen on Bhutanese backstrap looms that I have examined and from videos, the warps under which the supplementary wefts will be passed are selected from those in the stick shed and then from the heddle shed and stored on two patterning sticks. This is the warp that I used for the Bhutanese designs. The two sticks bound together with rubber bands are the stick shed stick and the stick which holds a second cross. The darker of the two sticks in front of those holds the patterning warps from the stick shed and the other holds the patterning warps from the heddle shed. 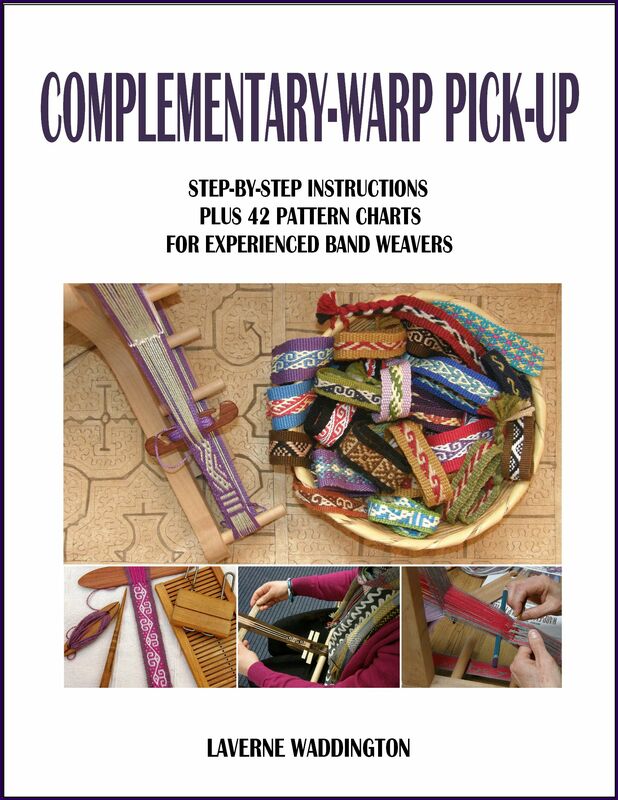 You can see my video tutorial of how these sticks are placed in a warp destined for Guatemalan patterns here. The spacing of the warp threads that are selected and stored depends on the kind of pattern being woven and, to a certain extent, the kind of yarn. Within Guatemala, this can vary a lot from region to region. The warp pictured above from San Antonio Aguas Calientes in Guatemala shows the two patterning sticks in place (the two thinnest sticks). These will be used to raise the warps under which the supplementary wefts are passed saving the weaver the work of having to pick them up from every shed. My weaving teacher in San Antonio Aguas Calientes has just selected the warps from the stick shed for her first patterning stick and is about the store them on a stick which will sit between sticks 2 and 3. Lydia will draw the patterning sticks toward her to raise the selected warps to weave patterns like the ones she taught me to weave above right. The patterns in the upper and lower bands were woven using the warps stored on the two patterning sticks. The flower patterns in the center band, however, require the weaver to select different warps for every pick and so, patterning sticks cannot be used in this case. Naturally, weaving those flower patterns was a much slower process. Here are some bookmarks that I wove using Guatemalan patterns. Most of these designs are based on those that I was taught in Santa Catarina Polopo. 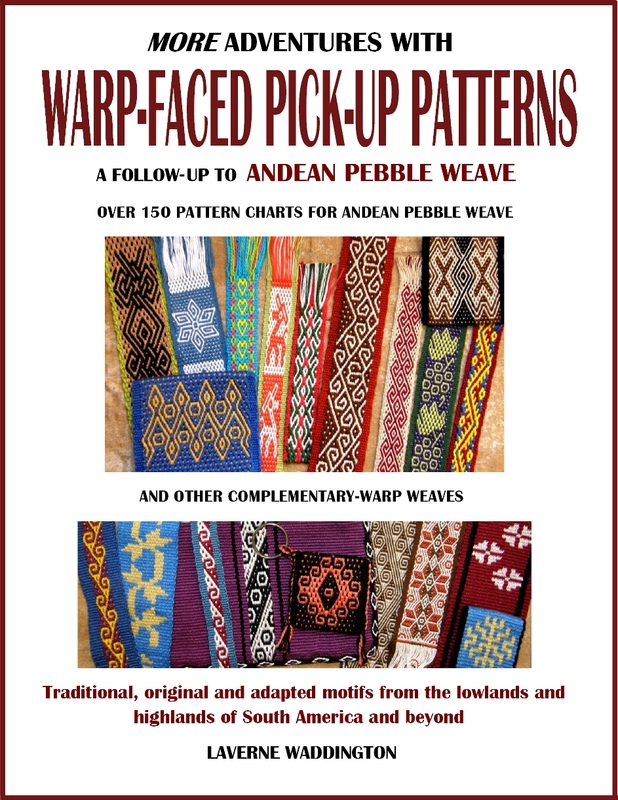 My teacher in that part of Guatemala also uses the two patterning sticks but the warps that are selected are spaced differently to those in San Antonio Aguas Calientes and you can immediately see how different the patterns are from these two weaving communities. Above, you can see how the warps are spaced in one of the pattern sheds. I have just placed the supplementary weft which will allow me to weave the stem and base of the plant. Here are some more patterns that I wove with my teacher in Santa Catarina Polopo. All the patterns except for the ‘X” design which separates some of the motifs were woven using the same two patterning sheds. On the above piece which I wove in Guatemala alongside my teacher, you can see all the patterning techniques that I used in my latest Bhutan-influenced sampler…the horizontal and diagonal “chain stitch” lines and the solid “stitches” that serve to fill in the outlined shapes. The question was, how do the Bhutanese weavers space the warps that they select for their patterning sheds? Frustrating!! I had a Bhutanese loom in my hands when I was in the US with unfinished weaving and sticks in place. I took lots of photos of it but did I think to look for that crucial piece of information? No!! 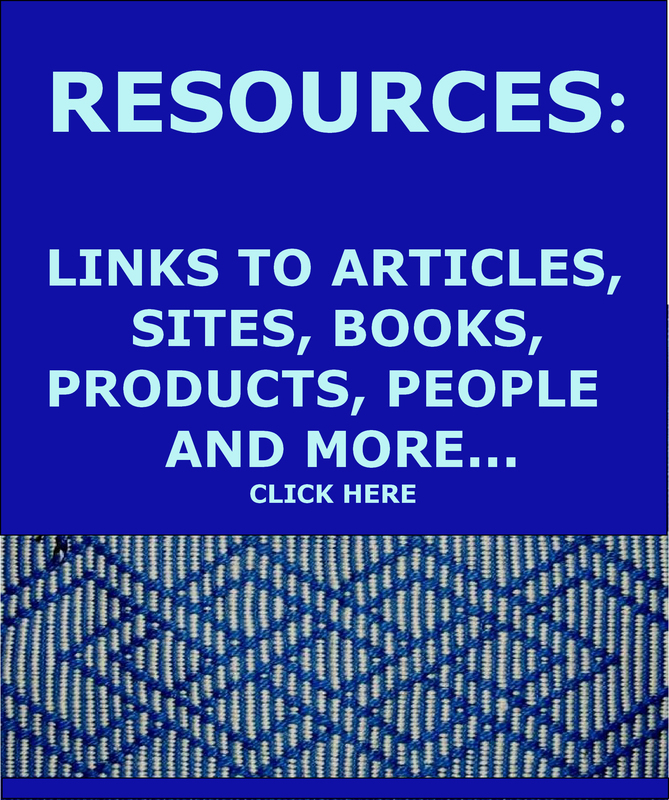 Thankfully, Wendy Garrity’s wonderful website came to the rescue. Pictures and sketches that she has there gave me the answer. As I said, it is quite likely that the spacing varies from region to region within Bhutan as it does in Guatemala but, I used the spacing that I saw in the pictures, and it seems to have worked. Here is the piece growing on the loom. I didn’t use the patterning sticks with their pre-selected warps for the designs in the foreground. The sheds for those patterns had to be created manually for every pick. Things to work on…making the supplementary-weft turn “bumps” neater and of a more consistent size, making a smoother transition from horizontal to diagonal line…I messed that up…, calculating better the amount of weft needed for a particular design…I wasted too much yarn! I think of how accurate the Guatemalan weavers are. They know exactly how much weft they need for each of their patterns and waste nothing! Some of it has been trial and error…finding a neat way to start the chain stitch took quite a few attempts. My Guatemalan teachers work that stitch one thread at a time whereas the Bhutanese weavers have a very cool way of working it using both threads at once. The end result is the same but it is these little differences that are so fascinating. I look at Leki Wangmo’s magnificent work (above) and sigh! 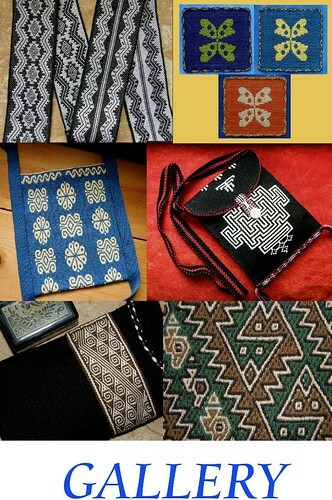 Here are more gorgeous Bhutanese textiles that Ute left for me to examine while I was in Massachusetts…bands of supplementary-weft patterns on a ground of extremely fine tablet-woven cloth. I was told that the tablets used to weave the ground fabric had to be cut from X-Ray film to achieve such fineness! He he :-)…one more shot of the whole lot so far. Can you tell I have been having fun with this? Now on to much finer yarn. I have some cotton that my friend Betty got in Guatemala about 30 years ago…much finer stuff and I am thinking about making a very light-weight scarf with it with supplementary-weft patterns using the techniques I have been practicing on the sampler this week. The motifs will be smaller using this finer thread and the whole thing will hopefully look a lot more delicate than the sampler with its large kind of clumsy motifs. I can use it on my spring and fall trips in the US. I am thinking black with lots of small colorful motifs. This is my first sample using the 60/2 silk that I got at Handweavers Studio in London (it was a splurge and one of my souvenirs of the UK trip!). 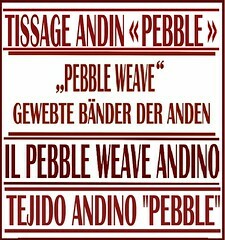 I saw this pebble weave design on a textile in a book and found it quite unusual. The picture’s caption states that it was most likely woven during the colonial period. The silk weaves up beautifully and yes, it is hard to see! All the little nicks and chips in my finger nails become immediately apparent as the fine silk catches on them. Now I just have to wait for THE project for this silk to come to mind. In the meantime I am getting the third post on the Encuentro de Tejedores de las Americas ready…yes, I know I keep promising it.! I look at those pictures now and can hardly believe I was there among all that magic! Look at these gorgeous ornaments made from narrow woven bands! If you “Like” the CTTC on Facebook you can see many more beautiful images and news updates that don’t appear on their website. Off to dye that cotton and start planning my scarf! Love, love, love your supp weft and silk pieces! I will take you up on that Wendy and I hope you come and visit me. Can you imagine what fun we will have here at the loom together! You provide so much inspiration! There are so many techniques to learn and explore….. I am in the middle of one and find myself looking ahead to the next all the time! If only there was more TIME!!!! Thank you for your wonderful blog. Wonderfully inspirational post. I never continues it amaze me that such beautiful things can be created using such primitive tools! ….trying to type on iPad is difficult…. Wanted to say it never ceases to amaze me! Laverne, amazing as always. The colors are so incredible! Oh those ornaments are totally RAD! I really want to use up some of my narrow inkles that way! Your posts are always crazy amazing. So many beautiful bright pictures to feast on, and learn about! Cheers! Please do show us if you make ornaments, JQ. I wish I had some spare bands to play with that way too! More eye candy… love it! The ornaments made from woven bands are just too cute!